Can AR prototype solve the issues of e-commerce companies? Global e-commerce sales are about to hit almost $5.0 trillion by 2021. The whole market shows a tremendous growth, as just 5 years ago it was estimated at just $1.3 trillion. That gives us a huge growth of 265%. What contributed greatly to the growth of e-commerce sales is the enormous growth of mobile e-commerce. In 2015, not even half of the e-commerce was happening through mobile devices. In just three years, this number has risen to 73% and it’s not stopping yet. But this amazing growth comes with downsides too. As of the second quarter of 2018, only 2.86% of e-commerce website visits finished with purchases. Converting visitors into customers is getting harder and harder because of the intense competition on the e-commerce market. Because of such fierce competition, websites are mostly competing against each other by lowering the prices of their products. Comparison shopping websites make it incredibly easy to compare hundreds of offers in the blink of an eye. While it’s a great feature for customers, it forces the e-commerce companies to focus completely on lowering their prices, leaving companies with a different approach behind. What are the pain points of the e-commerce industry? As I already mentioned, the price war in e-commerce is one of the industry’s biggest trends. But what about the companies that focus on quality than those offering the lowest possible price? If they decide to not compete by having the lowest price, then what can they do to differentiate themselves from the competition? One of the strongest trends in e-commerce is a significant growth of purchases done through mobile channels. A mobile e-shop can be much more than just a scaled-down version of the desktop website. Emerging technologies can make the impossible of yesterday, happen now. This leads us to another pain point of the e-commerce market. People want to see their product in a real-life environment. Several studies show that the most hated thing about online shopping is the prospect of return process. 80% of customers are deterred by the inconvenience of online shopping returns. That’s where in-store retail still has the upper hand. The customer can see a product from all sides, measure it and imagine how it would look like in their home. E-commerce can’t provide this level of engagement and reality of the purchasing process. But can it at least tighten the gap and provide a realistic substitute for physical contact with a product? The answer is: yes! Thanks to the amazing Augmented Reality experience. How can emerging technologies like Augmented Reality help? As mentioned before, e-commerce can’t compete with in-store retail on certain fronts. But the growth of mobile e-commerce and amazing advances in emerging technologies give us brand new opportunities. Things that were not possible from your PC desktop, are now easily available because of the mobile devices we all have. One of these amazing new technologies is Augmented Reality. If you’re not really sure what Augmented Reality is – check our article on the basics of AR and VR. While you might associate AR with extremely popular entertainment/gaming apps like Snapchat and PokemonGO, it has a lot to offer when it comes to business opportunities. That’s how we came up with an idea to help e-commerce companies stand out from the crowd! Knowing the pain points of the e-commerce industry, we wanted to use Augmented Reality to help companies overcome their most common challenges. And how else could we do that than by making a working prototype of an app that would help companies to truly stand out and bring a lot of value to their customers? Check the video below to see how our AR refrigerator prototype works! In the latter part of this article I will explain what was the process of making the prototype in just 5 days. Our idea evolved around white goods because we know how tough this market has become. But keep in mind that the same approach can be used to help other companies that sell online too! We wanted to deliver a prototype of the app that would allow a white goods company to stand out from the crowd and beat the competition. Not by getting into the price war but by giving its customers a lot of value and making the buying process a quality experience. Our main goal was to reduce the clients’ doubts, fears and hesitations of buying white goods online. To achieve this goal, we knew we would have to add something to the buying process that will make the potential customer much more confident with their choice. First of all, it’s important to show how we worked in terms of the roles in our development process of the prototype. Our Business Development expert played the part of a client that needs a working prototype of an app that improves the sales process of white goods. He was a source of information of the needs and expectations of his customers. He fed our teams with all the necessary data to start the project. When it comes to building a working prototype of an app, the design team’s efforts are crucial to the success of the whole project. Their work decides if the app succeeds or fails. We all know that excellent UX can truly boost a project’s results. What great design can also do is make software developers’ work much easier. 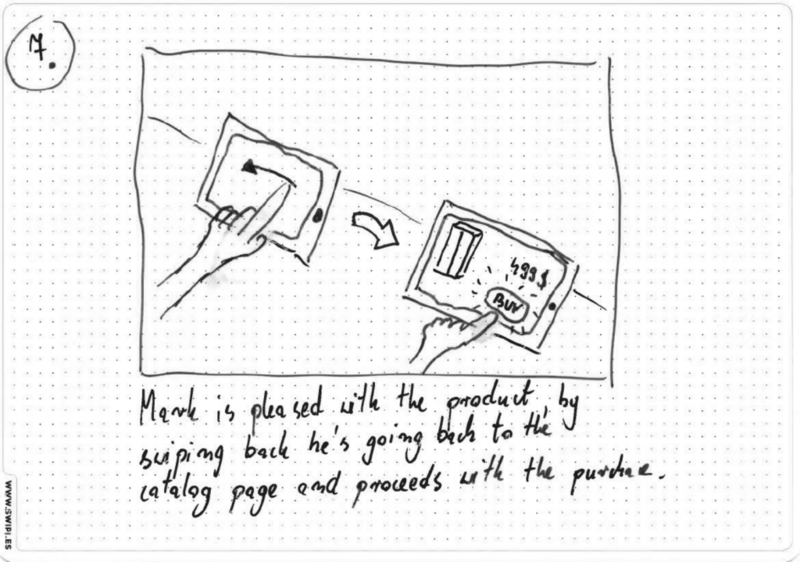 With clear UX sketches, storyboards and maps, developers know exactly what they need to deliver. That was definitely the case for our EcoBlue project. Last but definitely not least, every project needs a Product Owner. This is someone who coordinates the efforts of all the teams and is the link between the app developers and the client. How the Design Process looked like? As I have already mentioned, Design is absolutely crucial when it comes to building a great working prototype. 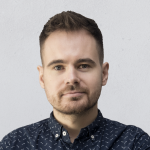 A prototype is not about great quality code – it’s all about letting the client know how the app might look, what it can do and what kind of crucial pain points it can solve. The discovery stage starts the Design process. This is when our design team learns about the idea in details from the stakeholder. The first result of this stage is a UX one pager – the document that explains the problems that need to be solved by the app and how we want to approach them. Apart from this, the design team produces low-fidelity screen mockups, which can give you a first glimpse of what the app will look like. The design Team also creates user journeys, which are a graphic representation of how the users might behave while using the app. The last thing that’s created during the Discovery stage is a Storyboard. 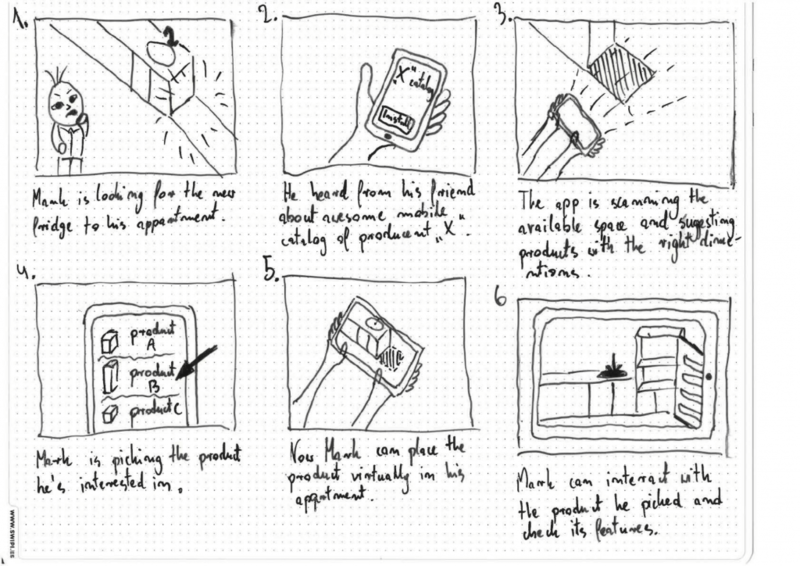 A storyboard is a description of the key aspects of the solution and the context in which it will function. The second stage – Rapid Prototyping – is all about prototyping the elements discussed, described and designed in the first phase. It lasts 2 consecutive days. That’s also when the software developers create code, which is based on the results of the Discovery Stage. The third phase is the final touch – delivering a high-fidelity working prototype, supporting its implementation and controlling the quality of UX & UI. This kind of comprehensive design process makes it much easier for the developers to build an actual working prototype of the app. For many people design means only the visual part of the project and its graphical elements. But design is much more than this. It’s all about discovering the needs of the app’s customers, anticipating their behavior and trying to solve their problems. If you’re interested in our design process and how we bring a lot of value to our clients through Design Sprints – check our article on how to save money & reduce risks with Design Sprints. So what exactly did we build to solve the problems of the e-commerce industry? Paper sketches? Blueprints? No! We produced a functioning high-fidelity prototype of an app called EcoBlue. EcoBlue is the app that allows the potential customers of a white goods company to browse through the catalogue of available products and literally put a chosen item wherever they want through the amazing Augmented Reality experience. How does it work? It’s very simple! First you measure the space where you would like to put the item (the app gives you the precision of 0.5 cm! ), then you can choose from the appliances that can fit in the measured space and the last thing you need to do is to click the AR button. Thanks to the amazing AR technology, an extremely realistic model of the chosen appliance will appear in front of you. Now you can play with it, see it from different angles, check how it looks inside and change its available color schemes. If you’re happy with the way the appliance looks in your kitchen – just add the item to the cart and finish your order. It’s that simple! With traditional desktop e-commerce this kind of engagement with a potential purchase would never have been possible. That’s why it is so important to take advantage of the opportunities presented by mobile devices and emerging technologies. After identifying some of the pain points of e-commerce, we came up with a working prototype of the app that can potentially increase the sales of white goods and help a company attract a lot of attention on an already highly competitive market. We have proved that implementing emerging technologies to sales and marketing efforts, can be a great way to beat your competition. We have also demonstrated that in only 5 days we are able to deliver a high-fidelity working prototype. The kind of prototype that gives you a real feel of how the app would look, work and impact the sales process. Creating the high-fidelity prototype, instead of developing the entire app right away, is a much safer process with reduced risks. It can be used for so many objectives – to kickoff the project, valide your ideas, get funding or check the most crucial part of your project! 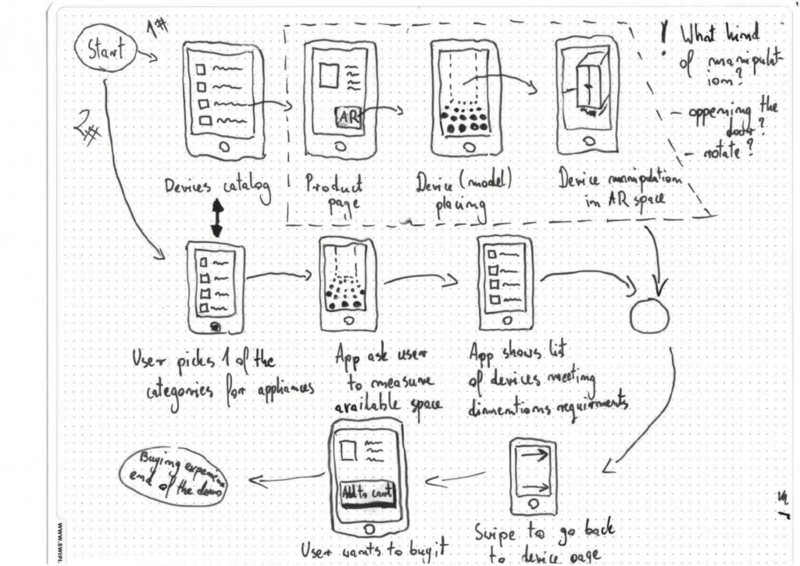 Do you want to build a high-fidelity prototype in just 5 days?